UD's education students are now better prepared for the classroom following coteaching experiences. 9:09 a.m., Sept. 22, 2015--It was the dawn of a new school year and for more than 300 teacher education students this meant that they would be taking their final step to becoming education professionals – the first day of student teaching. This used to be a very one-sided affair, where the classroom teacher would leave the room and the student teacher would take control of the class. But last year, the University of Delaware expanded its use of the coteaching model across its early childhood education (ECE) and elementary teacher education (ETE) programs, pairing students with 224 clinical educators from 42 pre-K-8 programs across five districts, five charter schools and three early childhood programs. Coteaching brings two teachers together to work as partners throughout the semester. The experienced teacher, known as a “clinical educator,” and the education student, known as a “teacher candidate,” share planning and teaching strategies, regularly consulting each other about the activities of the classroom. “The power of coteaching lies in the collaboration that occurs when two teachers work together. 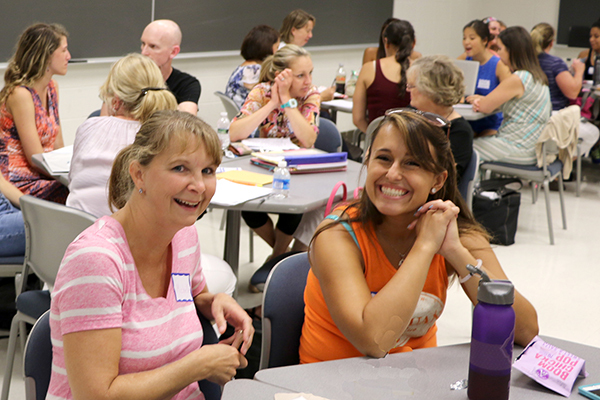 The teacher candidates are able to learn more by working alongside the clinical educator – their most valuable resource,” said Jennifer Gallo-Fox, assistant professor in the Department of Human Development and Family Studies who developed UD’s Early Childhood Coteaching model and has studied coteaching for over 10 years. Educators acknowledge that there is a learning curve to this model  it requires both trust and respect to share a classroom. To help both students and teachers develop a secure working relationship, UD’s Office of Clinical Studies held a series of Pairs Workshops in early September. Although the teacher candidates and clinical educators had already spent several days working together in their classrooms, the Pairs Workshop allowed them the opportunity to share their personal preferences, teaching styles, goals and challenges, aiming to build a strong collaborative relationship. Kotch-Jester received her doctor of education degree evaluating the impact of coteaching, before helping to implement it as the model for ETE majors at UD. “The findings of my study provide evidence that coteaching creates a supportive learning environment for teacher candidates to learn to teach. Teacher candidates work collaboratively with an experienced teacher to develop expertise in planning, management, instruction and assessment,” she said. The coteachers can both teach the lesson, or one teacher can lead instruction while the other provides support. They can break the class into groups, where each teacher can focus on a specific goal. They can set up stations or labs for hands-on learning and provide encouragement to small groups. The clinical educator can observe the candidate as she conducts the lesson and give thoughtful feedback, discussing the effective and less effective strategies. Having two teachers is a benefit for the clinical educator, as well. During the Pairs Workshop, one teacher shared that she had a child with special needs join her class unexpectedly. Although she did not have time to prepare her lesson plans to accommodate the child’s needs, her teacher candidate jumped in and provided the necessary support. "When we first switched over to the coteaching model, I felt at odds with the idea that a university student would be my equal partner,” said Linda Bledsoe, a retired third grade teacher who worked at Cedar Lane Elementary School in Middletown, Delaware. "But now I believe that by treating the candidates as equals, they get a more valid picture of the state of education today. They receive better training designing lessons, conducting assessment, conferring with parents, and are more flexible dealing with situations in the classroom." Coteaching has been utilized by Kathryn Scantlebury, professor of chemistry and biochemistry and coordinator of UD’s secondary science teacher education program, since 2003. As the concept has gained acceptance, it is now the student teaching model for both ETE and ECE programs.